Yummy Bites: what's your cup of coffee? what's your cup of coffee? what is the difference between all of these drinks...I just want a coffee..!! o_O?? 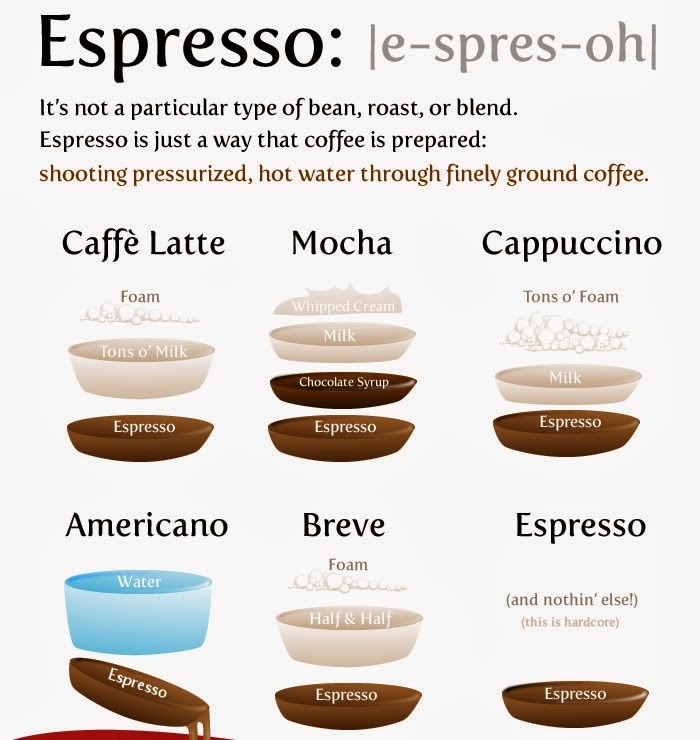 Now, its time to clear up all the confusion about all those different types. A short, strong and black coffee with no milk. A double espresso shot. For those who like it strong. An extra short coffee, even shorter than an espresso, with an even stronger flavor. Espresso topped with a dash of milk. Coffee made with steamed milk. Not as strong as a cappuccino, but just as good. A rich, full-flavored coffee with velvety, smooth texture. each flat white is hand finished with a distinctive pattern. A milk-based espresso drink using steamed half-and-half (a 50:50 mixture of milk and cream) instead of milk. Coffee combining espresso with steamed, frothy milk. chocolate on top, if you like to have sweet tooth. Espresso with hot chocolate, topped with steamed, frothed milk. Coffee mixing shots of espresso with hot water, and milk if you like. All these coffees are prepared using “Coffeemaker” without having to heat water in a separate container, rather using a number of different brewing principles for each type on machine. The common type prepared at homes on stove is somewhat Flat white without distinct patterns. 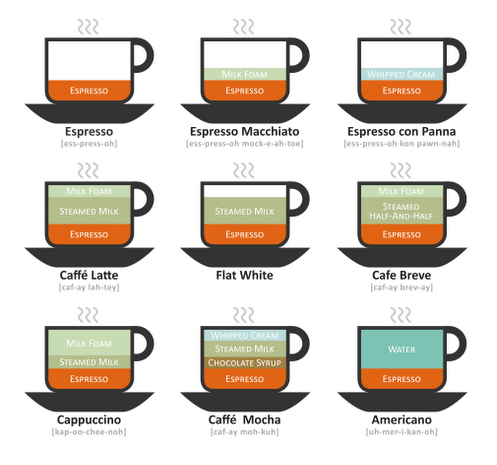 Now you can easily order coffee of your type… Enjoy..! Feel free to comment or ask anything regarding recipe. This article is © Copyright – All rights reserved - Blogger - "Yummy Bites By Abiyah" - You may publish translated versions of this article on non-English language blogs provided you acknowledge Blogger-Yummy-Bites-By-Abiyah as the original source.